Let's go to California for one of the first U.S. competition this season. Anaheim ICE Synchronized Fall Classic gathered around twenty American teams. Relive this unforgettable competition day. The day started off early with many ISI teams competing for the first time. Then, the competition transitioned into the IJS events starting with the Junior short program with two teams, Silver Stars representing the St. Moritz Ice Skating Club in Dublin, CA, and Team Delaware representing the University of Delaware Skating Club in Newark, DE. This is Silver Star's second year in the Junior division and there was a clear improvement on behave of their performances from last season. Team Delaware was a strong contender in this competition after finishing 7th in the 2016 National Championships last season. Both teams skated well, though Team Delaware ended up winning the short program with 36.66 with a strong lead going into the free. Right before our short at Anaheim! Next, the Novice and Juvenile events took the ice. Only one team competed in each event, Tremors of the Skating Club of San Francisco in Novice and Fusion representing the Figure Skating Club of Southern California in Juvenile. One of the biggest events of the day was the Open Juvenile division consisting of eight teams. 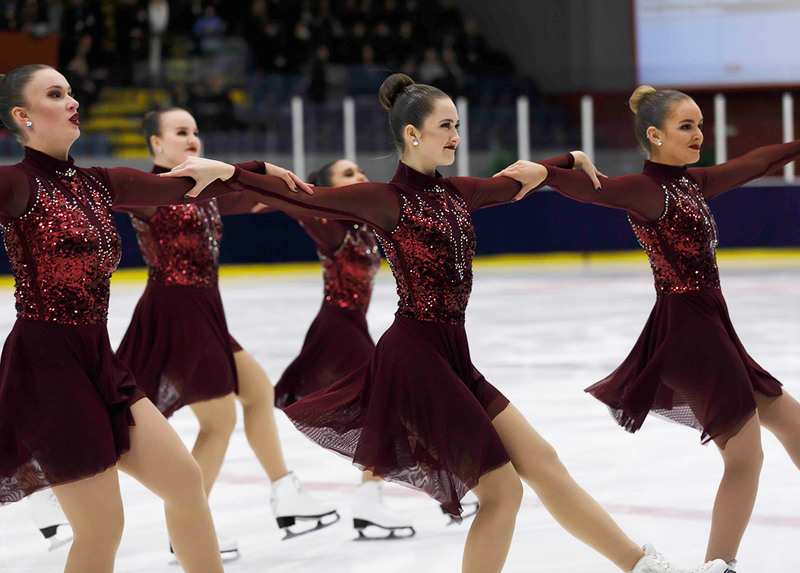 The teams that competed in this division were mainly California natives, Rose City Crystals, ICE'Kateers, Silver Stars, Ice-Cadettes, California Gold, Shining Blades, and Starlit Blades. Also, the Washington Ice Emeralds from Seattle, WA! All the teams skated strong programs for their debuts of the season. Shining Blades, representing the San Diego Figure Skating Club were the strongest team to compete in this division and ended up taking 1st based on their skating skills and technical ability. Following the Open Juvenile teams, was the Senior Short event. This even consisted of only two local California teams, California Gold Senior and Team del Sol Senior. California Gold is back in the Senior division after going on hiatus for two years. California Gold skated a solid and clean short program that had some good choreography. All in all, they made a nice impression in the short to their season after being absent from Senior for a couple years earning themselves an overall score of 38.76. Team del Sol had been recently renamed Team USA for this season, after have successfully competed at their first international assignment in Dumfries, Scotland last season. Del Sol were the strong contenders in this competition, skating to "Americano" by Lady Gaga. They skated a clean short program and won the event based on their high technical element score of 21.53, as well as their skating skills and choreography component scores, putting out an overall score of 46.93. The Adult Division was no less of an exciting event to watch after Senior Short. Majority of the teams came from all over California, as well as Denver Synchronicity from Denver, Colorado. California Gold Adult skated to a "Vegas" themed program and entertained the audience by their humorous choreography that played well with their theme. Denver Synchronicity Adult skated a solid program to fun and flirty 50s themed music. The second biggest event of the day was the Intermediate division consisting of two flights and eight teams total. The majority of the teams were based from all over California, including, Rose City Crystals, Starlit Blades, California Edge, California Gold, Fusion, Team del Sol, and The Rockers. Denver Synchronicity made another appearance in this competition in the Intermediate division as well. This event was a nail bitter! Most of the teams were strong contenders in fighting for 1st, 2nd, and 3rd. 1st place winners were Team del Sol Intermediate representing the San Diego Figure Skating Club. They skated to a "cat" theme and displayed solid execution in their elements throughout their program earning them the a 5 point lead in their technical element score of 27.18 and a combined score of 52.30. Close behind them and winners of the silver medal was Denver Synchronicity Intermediate skating to a "baseball" theme. DS did have one fall in their program, however them team had choreography that satisfied their theme very well. This enabled them to score the highest component mark given by the judges in the whole division of a 4.06 in choreography. With a total program component score of 24.86, they were .26 shy of TdS. Rounding out the Intermediate division for the bronze medal was Fusion Intermediate from the Skating Club of Southern California. Fusion skated a clean program to a "flight attendant" theme and impressed the competition with the up keep of their presentation and fun choreography, giving them a combined score of 47.10, .59 points away from the silver medal. Lastly, to end the night were the Junior and Senior free skates. Senior free skated first with Team del Sol Senior to take the ice. They skated to a "Mask of Zorro" theme and opened their program to a fast angled intersection. From there, Del Sol skated a clean a fierce program, and introduced the new rule of two required group lifts (prior to only one last season) with two variations of a flat position for the flyer in the air. They earned high marks in performance execution, choreography, and interpretation, giving them a total segment score of 82.88 and a combined score of 129.81 for both programs. California Gold Senior skated to the "Haunted Mansion", and gave the audience a creepy interpretation to their music that complemented their theme well. They had one fall, but were able to pull off the difficult split lift as one of their group lifts for their program. Cal Gold earned a total score of 65.41 and a combined score of 104.17. All in all, this competition was very small compared to how it has been in previous years. Though, many teams skated a solid debut to the season with their programs. 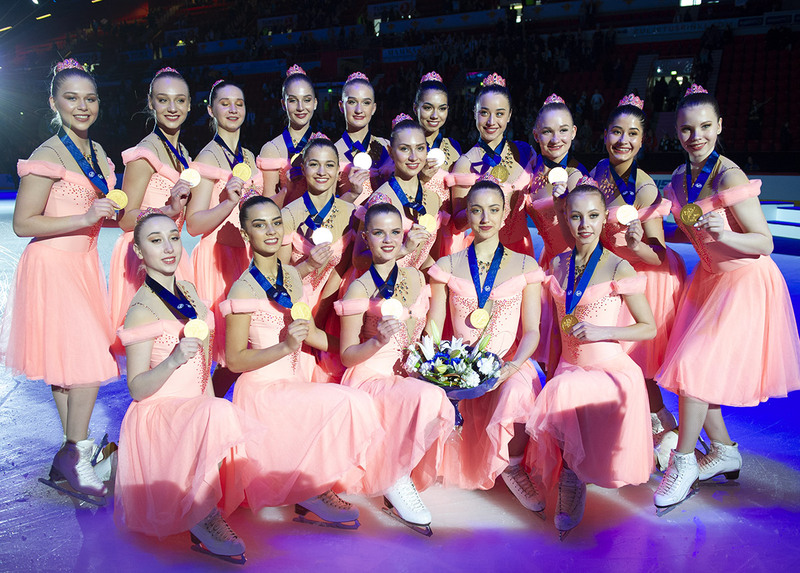 For many skaters, this was their first synchro competition. Personally seeing their little faces full of excitement to step out on the ice is something to cherish every year at the Anaheim ICE Synchronized Fall Classic Competition. Of course, the competition would not have turned out as a success without the energetic crowd and endless California sunshine in the heart of Anaheim. I've been skating for almost 11 years, 9 of those years I skated on synchro teams. Most of my success was with Team del Sol from San Diego, California. I skated on their Intermediate, Novice, and Senior teams. Most recently, I spent the last two seasons skating for their newly formed Senior team, under the expertise of our head coach, Karen Wiesmeier. Just last season, we were sent to our first international assignment under Team USA where we won the gold medal in the Trophy D'Ecosse Competition in Dumfries, Scotland. In the meantime, I enjoy soaking up the California sunshine by spending time at the beach and eating as much Mexican food as I can get. 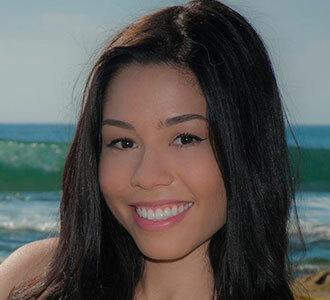 I currently study at San Diego State University where I'm pursuing a degree in Marketing.